The Hubble space telescope has detected what scientists believe is the oldest galaxy ever seen before. Thirteen billion years. That would be the age of the galaxy recently observed by Hubble. It already existed 480 million years after the Big Bang. The new image, taken by Hubble and published in the journal Nature, was detected using a wide angle camera recently installed on the Hubble Space Telescope. The NASA scientists have observed a rapid growth of this galaxy in a very short time. They then think that there was a period when galaxy formation was intensively activated. About 500 million years after the Big Bang, there would have been a galaxy, while 150 million years later, a dozen others have emerged. The researchers even claim that this account has doubled from 100 million years. First there were a few stars and clusters, baby galaxies, and finally the majestic galaxies we see today, according to Professor Richard Bouwens, interviewed by the BBC. He compares the galaxy discovered by Hubble in a newborn: it is much smaller than galaxies like our Milky Way, but it grows faster. « We can use these new measures to know how fast the galaxies are formed and grow, » explains Professor Bouwens. They will also get more details about the early days of the Universe at the time of the first stars and galaxies. Robert Massey of the Royal Astronomical Society (RAS), believes the new image captured by the space telescope will also allow astronomers to adjust their theories about the evolution of the Universe. 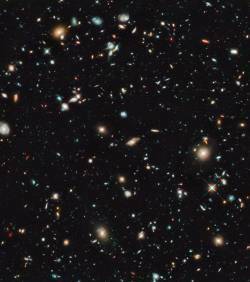 If this new Hubble observation is yet to be confirmed, scientists remain confident teams. In all cases, astronomers are eagerly awaiting the launch of the James Webb Space Telescope at NASA in 2014. The resolution of these instruments will be used, inter alia, to observe the first stars and galaxies that formed after the Big Bang. Suivant ›Le Nouvel Ordre Mondial…une définition!